Generally, the RadDataForm creates its fields automatically based on the type of the corresponding properties. Thus the proper editor controls are text fields for string properties, CheckBoxes for Boolean, DateTimePickers for dates, ComboBoxes for enums. 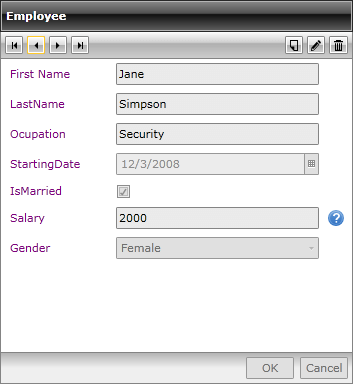 However, you are free to change each of the fields displayed. What you need to do is to set the AutoGenerateFields property of the RadDataForm to True and handle the AutoGeneratingField event. As it is cancelable, you may reject the cretion of a particular field. Cancel: Gets or sets a value that indicates whether the operation should be cancelled. 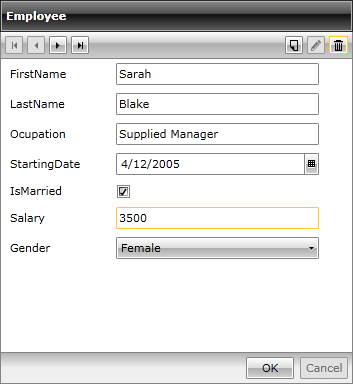 DataFormCheckBoxField: Used for editing of boolean properties. DataFormComboBoxField: Used for editing by choosing a value from predefined data source. DataFormDataField: Used for editing of string properties. DataFormDateField: Used for editing properties of type DateTime. PropertyName: Gets or sets the property name of the corresponding field. PropertyType: Gets or sets the property type of the corresponding field. The AutoGeneratingField event will be fired for each current item, thus enabling you to customize the view on item basis. e.DataField.Description = "This is the initial salary!"